Unable to cope, Sundar’s mother tried to kill herself by taking a lot of sleeping pills. Sundar cried, for he didn’t know what to do. Mumbai is India’s largest city, with a population of 21 million in the greater metro area. Sundar attends James Memorial Higher Secondary School, a Seventh-day Adventist school in southern India. The school has more than 900 students. Part of this quarter’s Thirteenth Sabbath Offering will help build a new girls’ dormitory on the campus. Save your money this quarter so you can give a big offering to help this school provide the girls with a clean and healthy place to live while they learn about God. Sundar’s [SUHN-dahr] bashful smile hides the fact that he’s experienced more sorrow than many young people his age. He grew up in a home filled with harsh language and violence rather than peace and love. His father and mother often argued, usually about money. When his father became frustrated, he often beat his mother. The only peace in the home came when Sundar’s father left India to work in a far-away country. He was gone for three years. When Sundar’s father returned to India, he quit drinking and even attended an Adventist church when a friend invited him. But he went back to his old ways, and the shouting and violence started up again. His mother recovered, but Sundar was so worried about his parents’ problems that he couldn’t concentrate on his studies and his grades fell. That is when his mother decided that her son needed to get away from the trouble at home, to attend a school where he would be safe and could focus on his studies. She had heard about James Memorial Higher Secondary School from friends, and she decided to send him there, hoping that being in an environment without fear of violence would help him to make a fresh start. That is how Sundar found himself making the long trip from his home in Mumbai, India [locate Mumbai in western India on the map], to his new school and home in southern India [locate southern India]. Although Sundar felt alone at the new school, he made a few friends and began to feel comfortable with his new classmates. 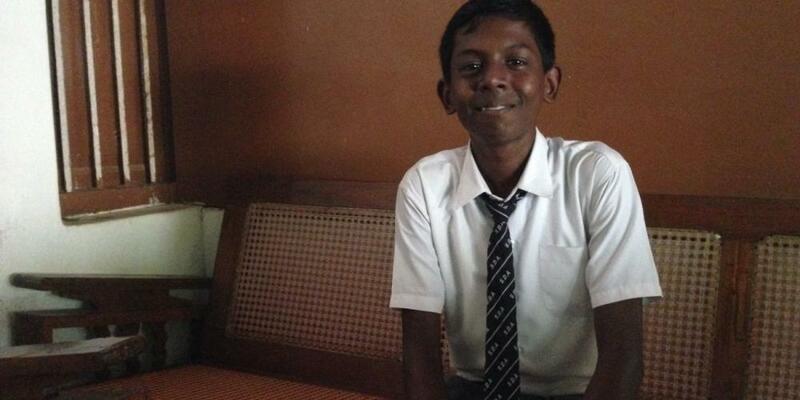 Sundar’s life has changed since he’s arrived at James Memorial Higher Secondary School. He has started to feel that this life is like a normal child’s now. He is learning about God, and has begun to trust Him with his problems. Sundar has learned to pray, and he prays for his parents every day. Smiling shyly, he says that he hopes that God will help his parents get along. “I just pray to God that my mother and father can live together happily,” he said. Sundar likes his new school and his new life. The students and teachers care for him and help him when he’s feeling lonely or sad. His faith in God is growing stronger every day, and he hopes he can continue studying at this school. Many students at Sundar’s school come from homes that do not know Jesus. They are finding that there’s a better way to live, a happier way to live, with Jesus in their lives. Part of this quarter’s Thirteenth Sabbath Offering will help build a new girls’ dormitory at James Memorial Higher Secondary School. It will replace the old dormitory that is no longer a healthy place to live. Please pray for Sundar and all the students at this school, and for their families who may not know that Jesus wants to be their friend and Savior.